One of the most impressive feats of construction ever achieved by humankind was the raising of the pyramids. Click here to play! Massive tombs built higher than practically any other building would be for millennia afterwards, people still debate over how the pyramids were created - by slaves, aliens, or as busy work for farmers after harvest in order to avoid uprisings. Regardless of how the pyramids were made, there is one pyramid that is most impressive of all, and there is only one slots game that you can see it in - the Platinum Pyramid slots! Featuring glistening platinum symbols and a pyramid made entirely of platinum bullion, you can almost hear the sound of a major jackpot going off just by talking about the game. 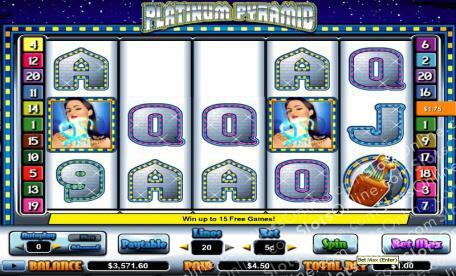 In the Platinum Pyramid slots, you must line up valuable platinum encrusted symbols in order to win big prizes. Platinum poker card rank symbols win minor prizes. For more money, platinum ankhs, sarcophaguses and other ancient Egyptian symbols will payout better. For the biggest prizes, though, you will need to line up Priestess symbols or be lucky enough to land a load of Platinum Pyramids on the reels. If you want to play for a share of a Pharaoh's ransom in prize money, then start helping to build the greatest monument in ancient Egypt by playing the Platinum Pyramid slots. The Platinum Pyramid symbol is the scatter, and it pays out on the total bet when 2 or more land on the reels. Also, 3 or more scatter symbols trigger 5 to 15 free spins with a triple prize multiplier. The Priestess symbol is wild, and it can substitute for any symbol other than the scatter.